Epec's engineering team offers full flex and rigid-flex circuit design services. During our application review and quoting process, we carefully examined specifications, materials and construction in order to minimize and eliminate any technical issues. 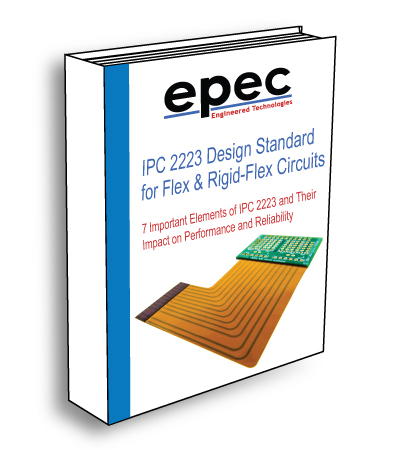 We also look for areas of opportunity for improving the design of your flex or rigid-flex circuit's reliability, functionality, and ensure there are no IPC design standard violations. Cost reductions are also identified to generate an accurate quote that is based on a manufacturable, reliable and cost effective design. Having a radiused corner within and flex bend area reduces / eliminates stress concentrators and improves reliability. For a more in-depth look, see our blog post on flex and rigid-flex bend capabilities. Staggering your designs layer to layer trace positioning eliminates the "I-Beam" effect which improves the flexibility and reliability of your flex circuit. Proper fillets and teardrops eliminate stress concentrations and improves the reliability of the flexible PCB. This is not recommended. Having vias within a bend area can cause a significant stress concentrator which may lead to breakage. Proper stiffener and coverlay terminations prevents creation of significant stress concentrator within the flexible circuit board. See our blog post on flex circuit polyimide coverlay and soldermask considerations for more information.